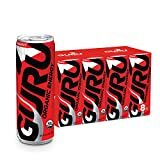 GURU Sparkling Energy Water is an adaptation of the popular energy drink made by GURU. This drink is made in Canada and certified organic. All flavor variations have the same caffeine content. They are all zero-calorie and sweetened with erythritol and stevia. 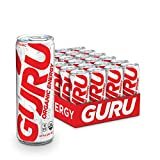 GURU Sparkling Energy Water isn't recommended for children or those sensitive to caffeine. Sparkling water, organic erythritol, organic pomegranate flavor, organic infused green tea extract, organic pomegranate juice concentrate, citric acid, organic stevia extract. 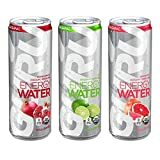 How Does GURU Sparkling Energy Water Compare? 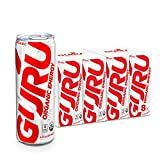 GURU Sparkling Energy Water contains 8.33 mgs of caffeine per fluid ounce (28.18mg/100 ml).